This will be my last cruise post. 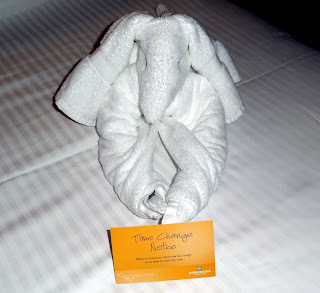 I thought you would enjoy the Terry Towel animals that greeted us after dinner most nights! Sometime this morning a wonderful, custom bookcase is being delivered to the Squash House for my studio. It will help to contain my massive growing collection of fabric and fat quarters! As soon as it is in place I'll post my progress on filling it up! Love these, but hope Mr. Squash isn't expecting you to carry on this tradition now that you are home. Can't wait to see your bookcase (and it's contents!). Those are so cute!!! What a fun surprise! I bet you guys looked forward to seeing what would await you after dinner every night!! The girls would have loved every second of that!! 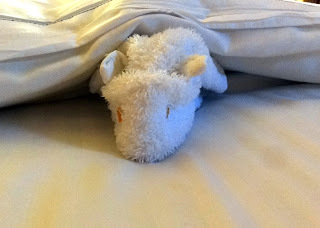 When we stayed at Disney World, every afternoon housekeeping would leave the girls a surprise like that!! So fun!! It's the little details like that, that make trips so memorable. 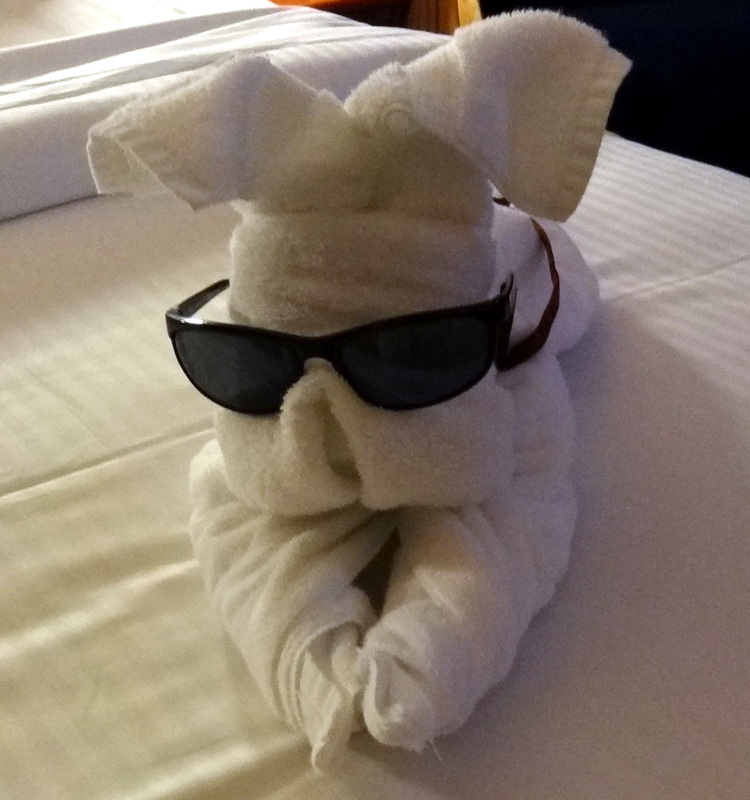 Now you can offer fancy terry towel critters when you have visitors! :o) Can you make a giraffe? Enjoy your new bookcase. Can't wait to see what you do with your new bookcase! Ooooooh! More space for stash!! At last I've found someone locally to maybe help me learn about wool applique and rug hooking!!! How cute! The cruise sound like a lot of fun. It's always fun to see which personal items they would use on the towel critters. 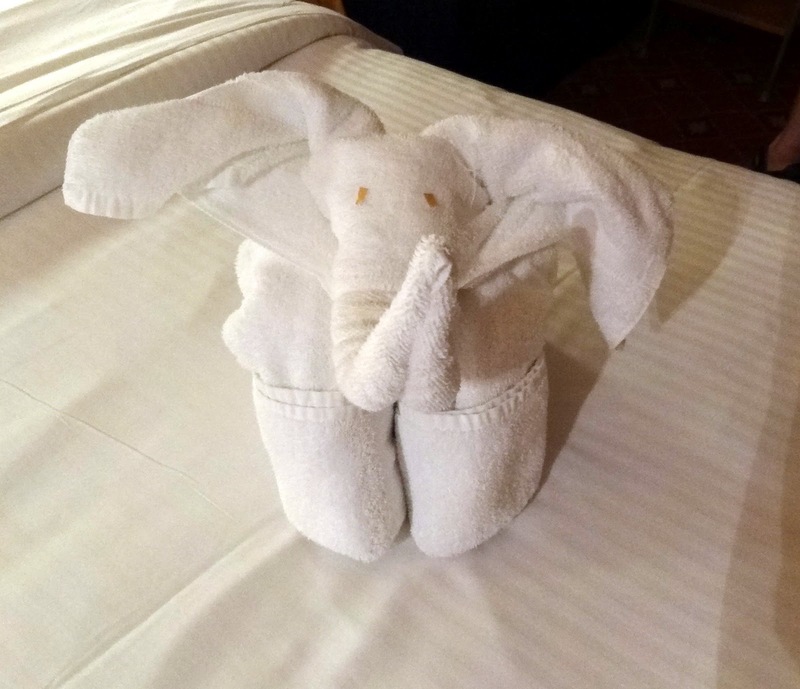 And I'll admit it, I did take a class Royal Caribbean offered once on how to fold the towels. Never folded one since. Looking forward to the new studio bookcase. I've completely emptied my sewing room and will starting painting it tomorrow. A make over!!! Would love to blog about it but I don't have a blog... can't think of a name to save my life! Have a great weekend Mr. & Mrs. Squash. There is an entire fan page on FaceBook dedicated to towel origami ( http://www.facebook.com/cruiseshiptowelfolding. These are so cute. I looked forward to a new towel origami animal every night on my cruise. Oh, I love those animals. When we visited Disney World (while living back east) we were greeted with some fun ones - makes washing your face before bedtime a whole lot more fun!